In order to be able to successfully manage a fishery it is important to have a good understanding of what stocks are available. To achieve this understanding the Authority has a dedicated research vessel, RV Three Counties, and a staff of research officers who regularly monitor the condition of the stocks within the district. 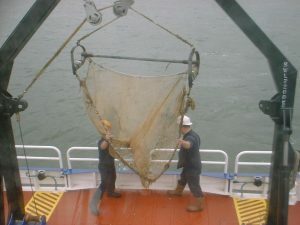 Surveys conducted at sea provide the data that can then be analysed using computer software to create stock assessments. ascertain what impact the previous fishery may have had on the stocks and to determine the extent of any spatfall that may have occurred. 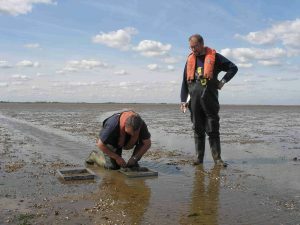 Since 2008 additional environmental data have also been collected from the cockle sample sites. This has included collecting information about sediment types and the distribution of lugworm (Arenicola marina), sand mason worm (Lanice conchilega) and Baltic tellins (Macoma balthica).Mussel surveys are generally conducted on foot at low water over a period of two months in Autumn, again the data acquired from these surveys providing information that can be displayed on charts and used to calculate stock levels. 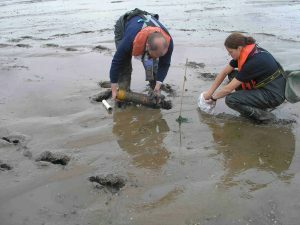 In addition to the work conducted on intertidal beds, the research team also undertakes surveys to discover new beds of sublittoral mussels. Unlike those found on intertidal beds, sublittoral stocks do not dry out at low water and are, therefore, more difficult to detect and map. To facilitate the identification and mapping of sublittoral beds, the research team uses RoxAnn Acoustic Ground Discrimination System (AGDS) equipment. RoxAnn analyses the returning echo from the vessel’s echo sounder, and by breaking it down into two values representing the hardness and the roughness of the ground, can be used to graphically illustrate the seabed features. When used in conjunction with Microplot computer software, this information can be displayed instantly as the vessel’s track. 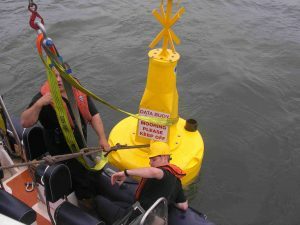 This is important because it enables features like mussel beds, which have a distinct RoxAnn signature, to be recognised instantly without the need to undergo extensive reanalysis later. In addition to finding sublittoral mussels, RoxAnn can also used to identify and map other seabed features such as the biogenic reefs formed by the Ross worm, Saballeria spinulosa. These fragile reefs are an important feature of the marine environment and as such are an interest feature of the Wash and North Norfolk Coast marine Special Area of Conservation (SAC) and the Wash Site of Special Scientific Interest (SSSI). As it is EIFCA’s responsibility to protect these features from fishery disturbance, potentially through a new byelaw, the research team have conducted numerous surveys since 2006 to map the distribution and coverage of the core reef features, providing information to assist the management process. To assist in both the sublittoral mussel and Sabellaria surveys, the research team acquired a Videoray Remotely Operated Video camera in 2007, which has subsequently provided a great deal of video footage of the seabed habitats.Crabs and lobsters are also of great commercial value to the fishermen working in the district. Since 2004 a comprehensive program of surveys have been conducted in order to study these stocks. In addition to studying landing data, this work has involved frequent surveys at sea conducted aboard commercial fishing vessels. These surveys have allowed thousands of crabs and lobsters to be measured, and unlike landings data, has enabled a population distribution of under-sized individuals to be ascertained. 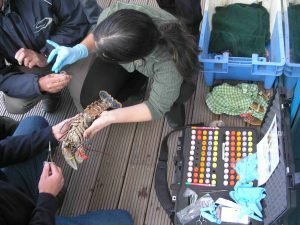 Between 2004-2006 approximately 2,500 lobsters were also tagged and released, allowing an insight into their growth and movement patterns to be determined from re-captured individuals.In order to protect the sustainability of the crab and lobster stocks, the Committee has a byelaw preventing the removal of berried (egg-bearing) females from the district. Although berried females are easy to spot, some fishermen are known to scrub the eggs off berried individuals making detection difficult. research team instigated a long-term programme to monitor the levels of Chlorophyll-a (a proxy for algae) at various locations around the Wash. 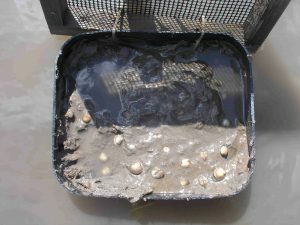 The short term aim of this programme was to determine whether food limitations could have been responsible for the cockle mortalities, with a more ambitious long-term aim of ascertaining localised shellfish carrying capacities within the Wash. Unfortunately, this latter goal, which would require external help with the modelling of the hydrology and food webs of the site failed to secure necessary funding to support the proposed Fellowship project post. In addition to our own core monitoring and research work, the Committee also assists other scientific organisations conduct their work in the area. Over the years this has included assisting Newcastle University (on behalf of English Nature) to conduct broadscale seabed mapping, CEFAS to conduct annual razorclam surveys and the Centre For Ecology and Hydrology to conduct bird counts and invertebrate surveys. Water and biological samples are also collected every month for the Environmental Health Organisation so that the water quality can be monitored. 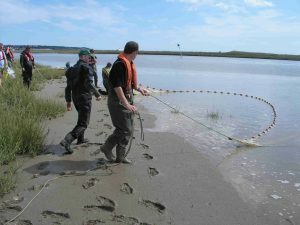 Plans are being developed so that from 2011 onwards EIFCA will begin conducting juvenile fish surveys in some of the estuaries within the district, potentially feeding data into the Environmental Agency’s Water Framework Directive.